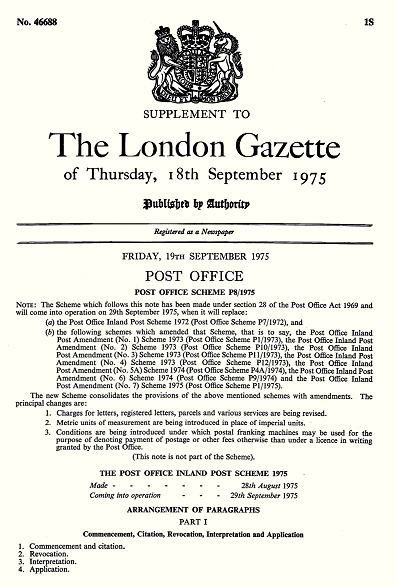 From 1969 onwards, the official legal announcements of changes to postal prices and services have been made in the form of "Post Office Schemes" printed in the official Government publication the London Gazette (and its companion editions the Edinburgh Gazette and the Belfast Gazette). They are thus a primary postal history source for the period. The first few postal Schemes were amendments to the inland and overseas postal regulations laid down by statutory instrument, and came into operation from 1st October 1969 (at which point the Post Office became a public corporation). In 1971-72 the regulations were consolidated into new Schemes. Most of the Schemes given here are in the form of amendments to the most recent complete Scheme, as altered by any previous amendments. This means that it is sometimes necessary to track changes through several amendments in order to work out the actual rules and rates that applied at a given point in time. The amendments were periodically consolidated into new Schemes -- which were in turn themselves subject to amendments, with further consolidated Schemes made at intervals. The PDF files here are taken from the complete editions available on the Gazette web site. As these contain many other legal notices and can be over 100 pages long, the postal Schemes have been extracted for ease of reference. Most have been taken from the London Gazette, but in some cases (where that was not available, or misprinted) the equivalent from the Edinburgh Gazette or Belfast Gazette has been used instead.